Medieval psalters were made to be used either for personal devotion or in church services, including the offices or daily cycle of prayers recited by monks. The Glenorchy Psalter was used in a monastery in Argyll, in Scotland, before the Reformation, but by the first quarter of the 16th century it was owned by the 3rd earl of Glenorchy, Colin Campbell. Its calendar, an aid to the manuscript's users in planning prayers and readings for services, lists many saints who were revered in western Scotland. Psalters used by monks for the offices sometimes have incidental drawings in their margins. They are difficult to interpret, but it could be said that they represent either a kind of response to the text or possibly entertaining distractions which would have to be resisted during prayers. 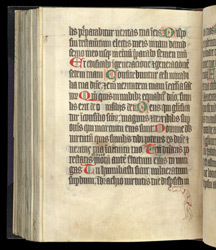 The bent-over figure in the lower margin of this page probably refers to the verses of Psalm 88 (89) above: 'I will crush his foes before him and strike down his adversaries.' This figure also serves a practical purpose: it signals the reader that the last words of the verse continue on the next page.